Editor's Note: This column was co-authored by Juliana Taimoorazy, the president of the Iraqi Christian Relief Council and Fellow at the Philos Project. 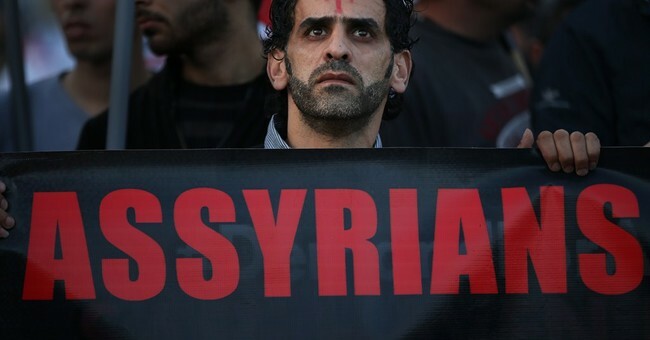 The recent murder of three Syrian Christians by ISIS is the latest chapter in the tragic history of the once-mighty Assyrian nation. Unfortunately most journalists covering the story focus on the generic plight of “Middle Eastern Christians” and the well-intentioned Western efforts to evacuate them abroad. For Assyrians, however, this is an Assyrian story that begs for an Assyrian answer – one that emphasizes not just religious but also national identity; not just survival anywhere in the world but long-term security in their ancient homeland; not just foreign assistance but self-liberation. The Assyrians want a new Assyria, big or small, and today they are closer to achieving that goal than ever before. After decades of lobbying Western governments, they are finally taking matters into their own hands. Far up in northeastern Syria near the Turkish border, these Aramaic-speaking sons and daughters of Ashurbanipal have laid the cornerstone for their national future in a newly-established Assyrian Local Administration, a self-governing cluster of 35 villages situated along the banks of the Khabur River. For anyone who knows the history of this valiant nation, the ALA will look less than impressive. Each of the 35 villages is an administrative unit from which every 50 adults elect one representative to a collective General Assembly. The General Assembly selects six individuals from its ranks to establish an Executive Committee. Five members of the Executive Committee supervise the ALA’s core institutions – everything from security to education to labor – and one member serves as an Executive Director who is responsible to the General Assembly. Not exactly the majestic political footprint for which Assyrians are historically known. But given the dismal state of the nation, the ongoing assaults from Arabs and Kurds, and the failure of Western governments to come to their aid, this new drive for Assyrian self-determination is the most significant in recent memory. The time is ripe. Externally, the collapsing regional order makes the rise of a new ethnic enclave more achievable than ever. Any political settlement in Syria – with or without Bashar al-Assad – will likely result in a confederation of ethnically- or religiously-homogenous provinces that manage their own affairs. The prospects of an Assyrian Christian province on the Khabur therefore appear sustainable, especially in light of Russia’s growing influence and commitment to being (or at least looking like) the defender of Christian orthodoxy. Internally, the confrontation with ISIS has lifted Assyrian national pride to a level unmatched since the beginning of the 20th century. Assyrians living under the ALA have revived the old Aramaic names of their villages and are using the language to teach general subjects in school. Young men are joining militias and risking their lives to protect their people and lands. Old feuds between religious denominations have taken a back seat as Assyrians see the need to work together. The vision is ambitious, no doubt. But it resonates with those of us in the West who are searching for likeminded allies in a region immersed in radicalism and intolerance; and it should more than resonate. The story of embattled Christians defending themselves against barbarian hordes should propel us from moral support to tangible action. The old Middle East of artificial big-tent dictatorships appears to be waning. The only hope for an America-friendly Middle East will be found in organic, self-governing communities like the one now sprouting along the banks of the Khabur. Our goal should be to equip and empower these new allies as they struggle against a common enemy and seek to introduce shared values in a region haunted by genocidal extremists. What Khabur offers is the opportunity to start small. The new Assyria needn’t be big. It needs only to embody the soul of its people and offer them some opportunity, even minimally, to be masters of their own fate. Only in that way can Assyrian Christians prevent ISIS from claiming another crop of victims. Only in that way can we in the West, working with local friends who are building from the ground up, ever hope to change the region for the better.